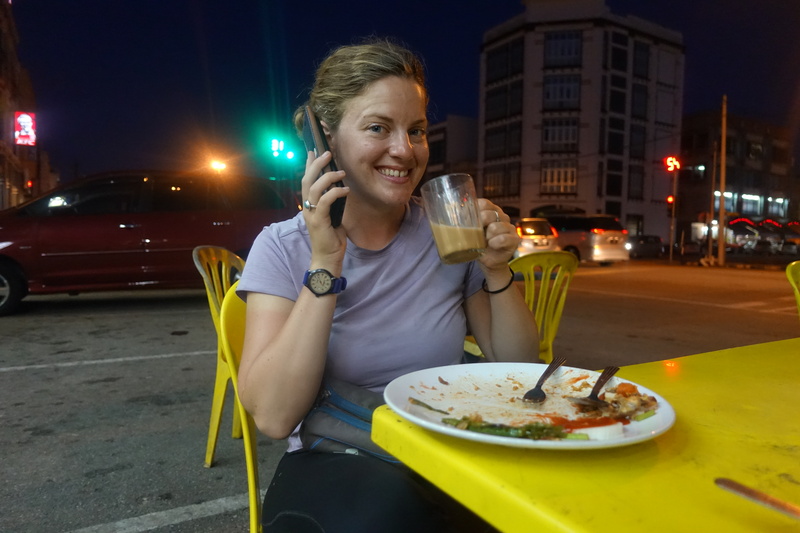 For this post, instead of writing a day-by-day account of our trip through Malaysia, I want to focus on a common theme throughout our whole time there. 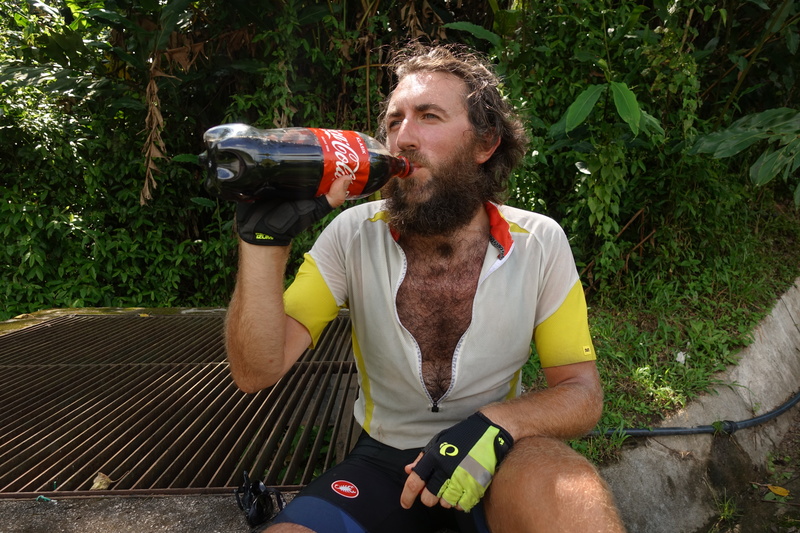 It was only on one of our last remaining days in Australia that Cédric and I realized that we’d by cycling through Malaysia during Ramadan, the fasting month. This was a bit worrisome for us because we tend to eat and drink what could look like being “uncontrollably” once we’re off the bike. Cédric especially appears as though he is only funneling food into his mouth in the evening. (Imagine being in a dark tent, nearly sleeping, and then you hear Cédric rustling through bags and chomping on nuts, while moaning “Damn, I’m hungry again”). 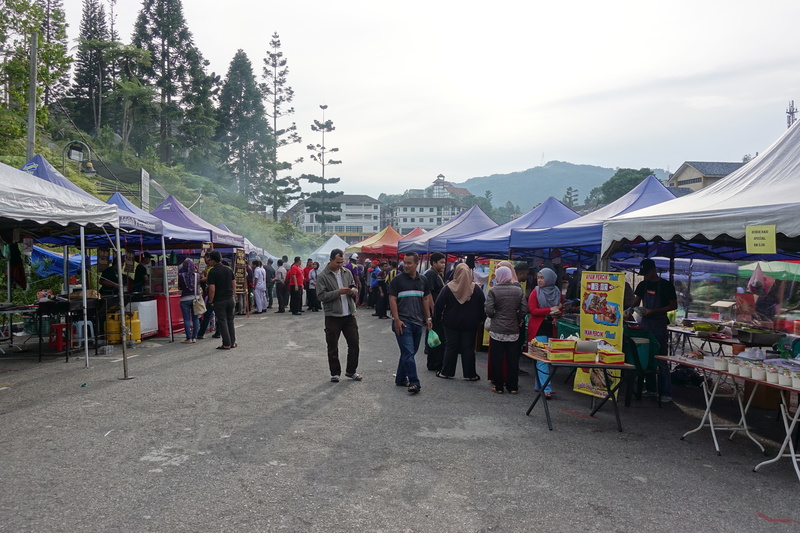 Our first 24 hours in Malaysia, Cédric and I didn’t notice much difference because the town of Kulai had a strong mix of Malay, Chinese, and Indian populations (the latter two not observing Ramadan). 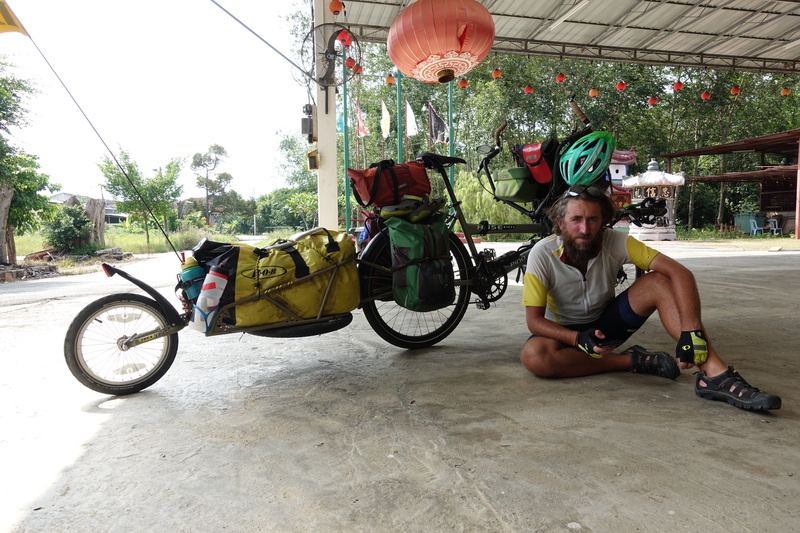 Once we started riding towards the west coast, however, it became apparent that a lot of roadside stalls were shuttered, with plastic chairs and tables stacked along a wall. Around lunchtime, we rode through village of Api Api in desperate search of food. Nothing except for a small market was open, so Cédric and I resorted to eating peanut butter sandwiches (aka. okay but not exciting) under the shade of a bus stop. 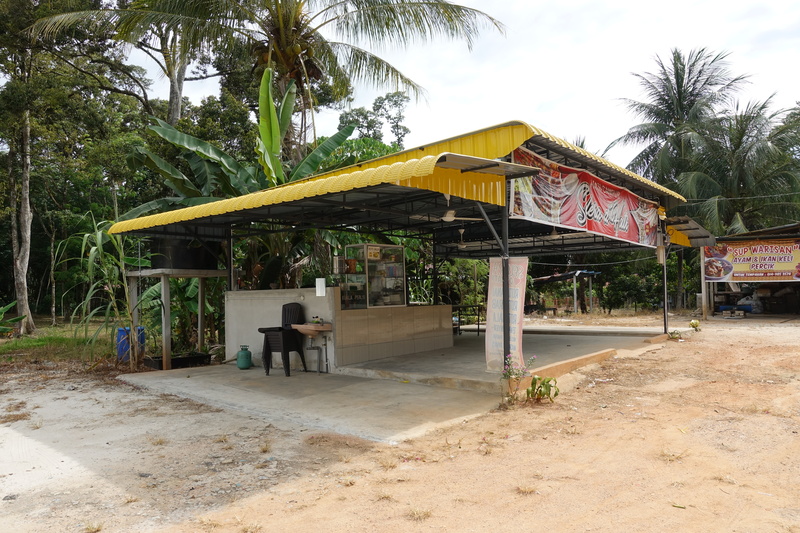 That night in Rengit, another small town, we also had trouble hunting down dinner (and later, breakfast… we learned that most Malay restaurants are closed throughout Ramadan). After being rather unsuccessful and resorting to gas station instant noodles, we devised a plan: plan to eat in bigger towns, not villages, and don’t be choosy whenever there’s an open restaurant – cooking is not wished in SE Asia (it would end up being more expensive and a lot less healthy/tasty), and chips or snacks at a gas-station not very enjoyable long term. A common accommodation type in Malaysia are the “homestays” (a Bed&Breakfast without the breakfast – you can get that outside in the street), and it seems that the Ramadan month made some people more religion sensitive (particularly in the southern part) by accepting only Muslim hosts. That quickly made our trip focus more on the Malaysian minorities (they still make up 50% of the population altogether), and unfortunately less on Malay-Malaysians (this post may be confusing, everyone is Malaysian, just some for a few more generations). Luckily we stuffed ourselves with thosi in Kulai. Also shout out to the guy who bought this breakfast for us! 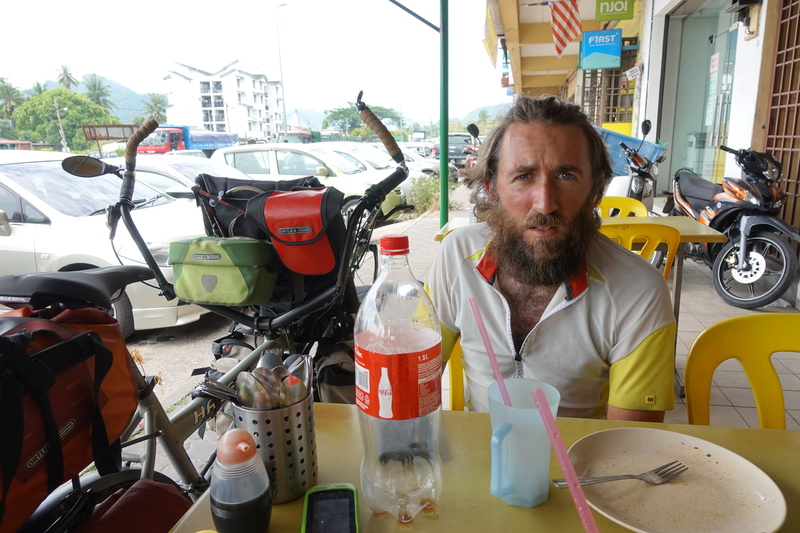 For lunch the next day, we had a lot more success at a Chinese restaurant in Batu Pahat. As the days progressed in Malaysia, Cédric and I became more perceptive to indications about whether we’d be able to find food: the presence of Chinese or Tamil schools (found with our map apps, it let us know that the town had a diverse population) and shops with a lot of people lingering around in the shade (we’d bike slowly through the main street looking into each storefront). 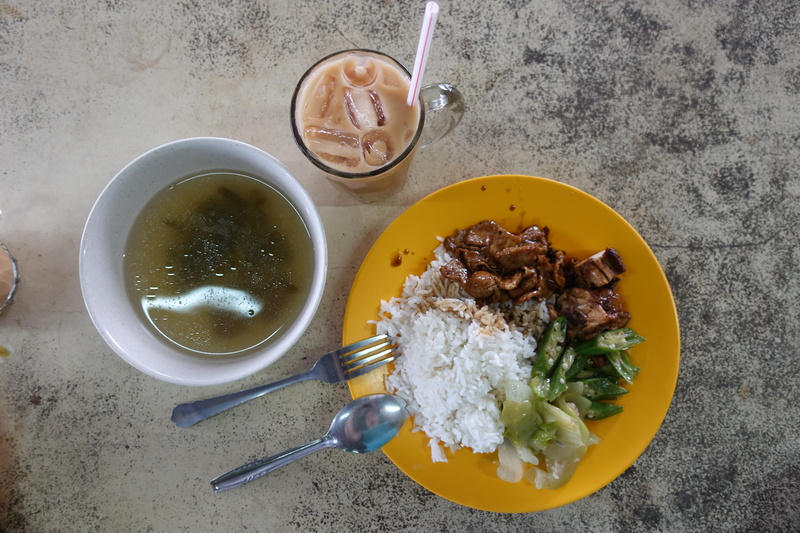 The better we got with knowing where the restaurants were, the more we increased our food intake – by the end of our trip through Malaysia, we were able to find a second breakfast of coffee and roti with ease and the correct timing (around 10am). The name of the town also gives a good hint of the cultural background of the town – larger cities are mixed, but smaller towns inland are fairly recent (mid-20th century). 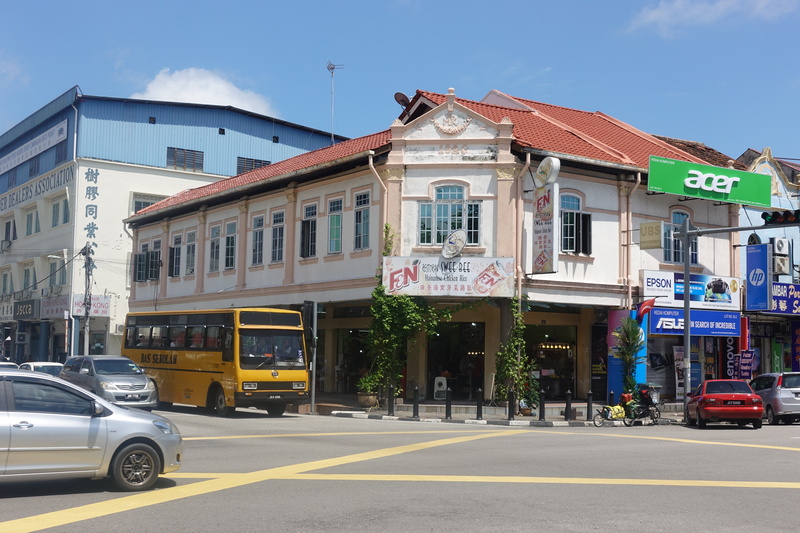 “Manchis” is for example mostly Chinese (and thus still very lively during the Ramadan), whereas “Sinpang Pelangai” about the same size, a few kilometers before was completely deserted without a single shop open (it’s most Malay). Here, we found a few people hiding in the shady Café, playing mahjong next to a Buddhist temple- indicators for snacks and coffee. 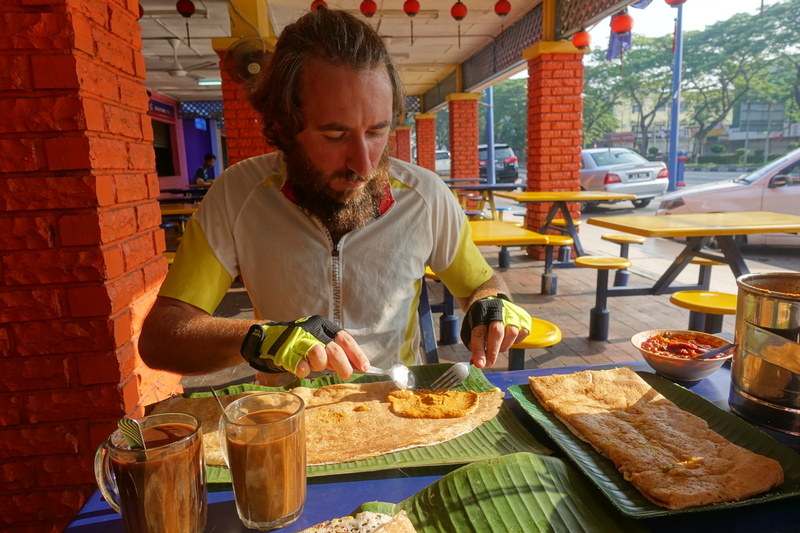 Cycling through Malaysia during Ramadan also made Cédric and I very aware of the country’s different cultures (particularly because we relied heavily on Malaysia’s diversity to prevent us from eating peanut butter sandwiches and ramen noodles for every meal). 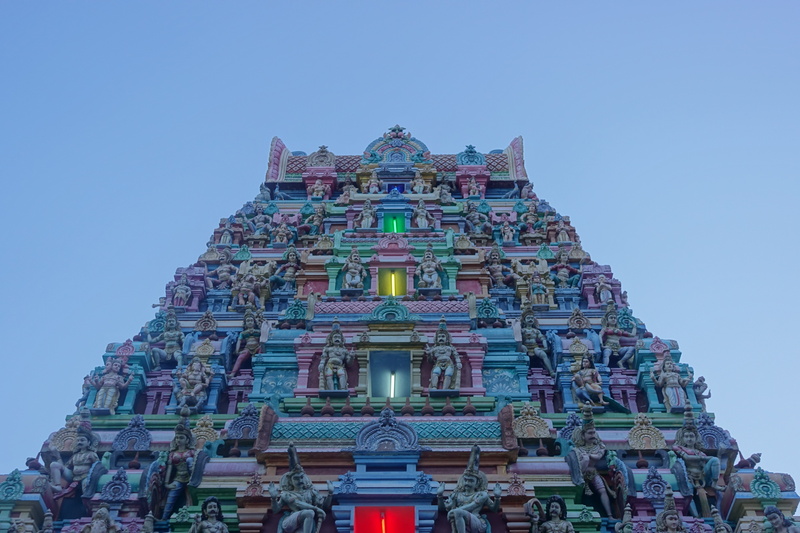 The Chinese and Indian populations are not recent immigrants, they have been in Malaysia for several generations and are Malaysian citizens. These groups retain a strong cultural identity and speak their ancestral dialect in addition to Malay (and for many, English). However, that doesn’t mean that these three groups are segregated from one another – we saw everyone come out for the Ramadan evening markets and patron the same restaurants. Overall, it seems like the Chinese community is the most entrepreneur and manages the larger businesses, whereas the Malays have a stronger political and cultural influence in the country. Indians are a smaller community and are not present in every town. We also noticed some other communities from much more recent migrants, from poorer Asian countries – notably Bangladeshis in the fruit and vegetable farms of the highlands (and apparently often cheap exploited undocumented labor…). 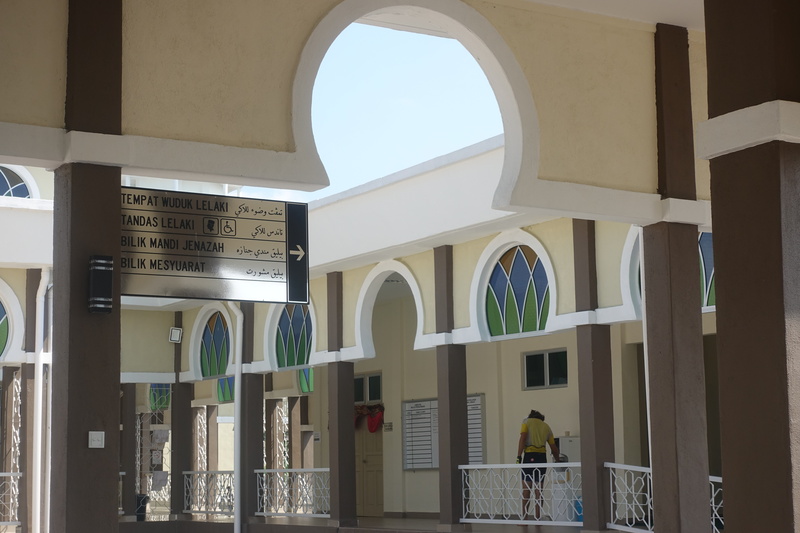 A mosque – great for shade, clean bathrooms, splashing cold water on the head and talking to people coming out of prayers. In addition to Malaysian restaurants, it appears many Malay-owned shops and businesses were closed during the 4 weeks of the Ramadan. Cédric and I could understand this, given how hot the weather was and people not being able to drink liquids during the day. We did find that some fasters weren’t as strict as they would like you to believe – while hanging around in the shade of a Buddhist temple one day, we met a policeman who wanted to drink his iced coffee and smoke a cigarette (also forbidden during the fast) without the community knowing. In a surrealist discussion, he told us that he was worried that other Muslims would take pictures of policemen not being very respectful of the rules… and shorty after told us that his paycheck of 5000 Ringgit per month (about 1500US$ or 1200€ – double the average income in Malaysia, and 7 times higher than farm workers we talked to a few days later) was not enough, and unless he would get a raise up to 10.000 Ringgit/month, he would have to keep on accepting bribes from infringing car drivers. 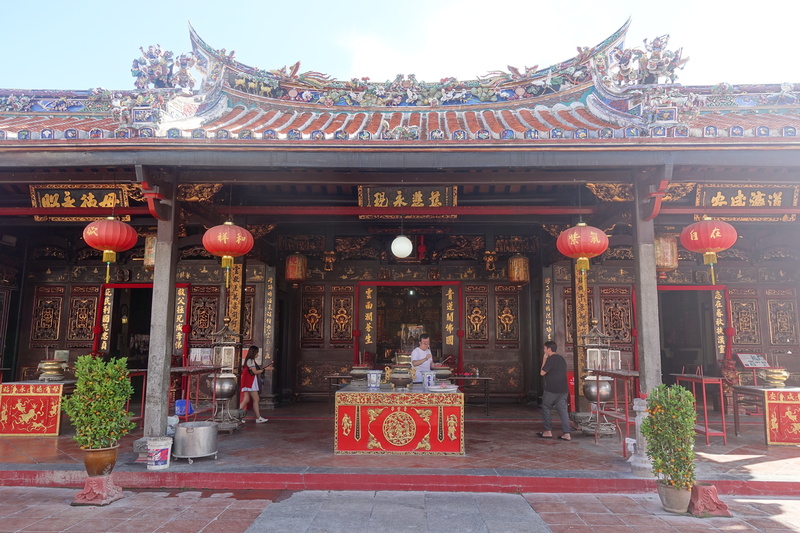 We discovered with him then that the best place to hang out for a snack, a smoke or a drink is behind the local Chinese community temple – and that was also one of our regular favorite location to get some shady quiet spot to rest. Given the number of plastic bottles and plastic glasses on the road at the entrance of towns, we noticed that during the Ramadan getting a sip of cold water while driving is fine… as long as you throw every evidence out of your car before your relatives and friends could see you! The usual combo of religions (Hindu, Buddhist, and Muslim) and probity… some rules for the others, but always a good exception for your own case. Although Cédric and I felt like our interactions with the Malays were somewhat limited during this time, we were able to take part in some Ramadan traditions. 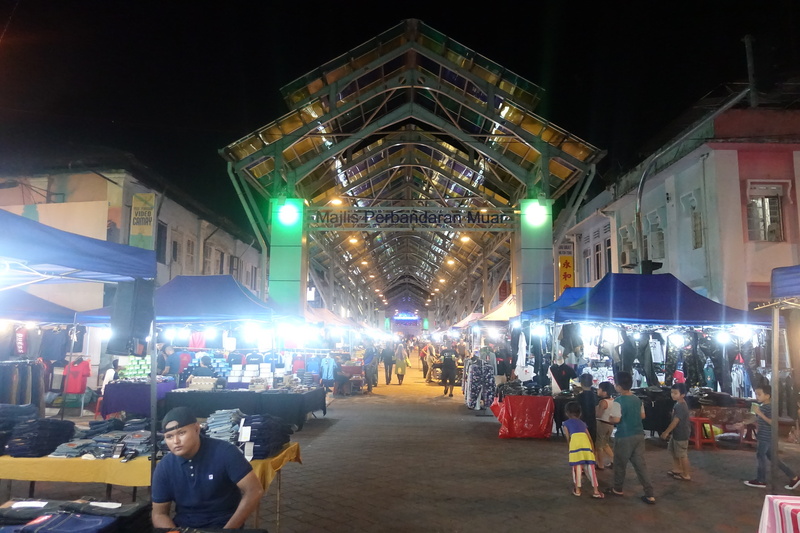 On our second day in Malaysia, we noticed that evening Ramadan bazaars were present in almost every town and city – which was the perfect opportunity to buy sweets and sugary drinks. They however only open in the evening, a few hours before sunset – great for dinner, not so much for the rest. Keeping cooked food for the next day also doesn’t seem like a wise idea, with a hot and humid weather being a perfect environment for bacteria…or for ants, absolutely the greatest creatures to always find a way to get into your food. 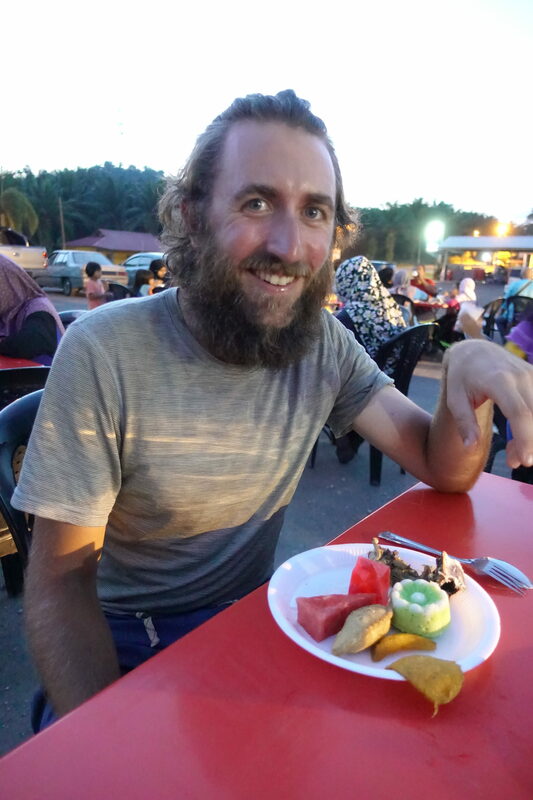 While we were in Sungai Koyan walking past a gathering, Cédric and I were also invited to the Iftar, the daily breaking of the fast at sunset. We were both completely taken aback and humbled that this group of people would want us to celebrate with them. 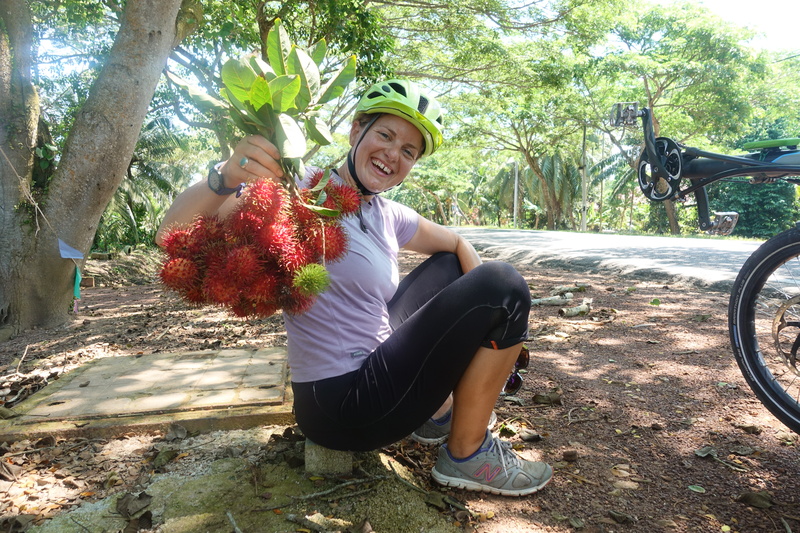 We were given these rambutans while taking a break on the side of the road – almost on a daily basis, the Malaysians talked to us, shared parts of their culture, and surprised us with treats. 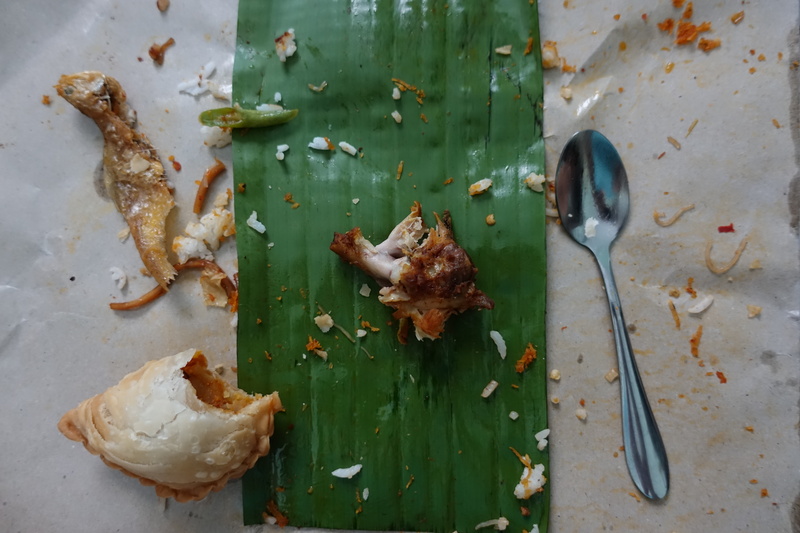 The remnants of a dinner given to us by our guesthouse host while she was still fasting – that became dinner number 1 out of 3 that evening – with everyone in Sungai Koyan inviting us! Cassie and Cedric, your daily intake of food had me wondering: How much food cost per mile VS. (if you were driving a small efficient vehicle) the fuel cost per mile? Of course there is the cost of buying and maintaining a vehicle (well there was also the cost of buying and maintaining your ‘iron horse’) – so exclude that comparison. But if you were each on a ‘normal’ daily diet of 2000 – 2500 calories / day (sounds like you probably double that by riding), I surmise that one could suggest that the real cost of riding on your bike is 2000 – 2500 calories / day x two people. So the daily cost is whatever the cost would be to purchase 5000 calories worth of food. 5000 calories, divided by an average of 50 miles / day results in 100 calories / mile. There are other factors too that may make this much more difficult to really compare. Bottom line though is that if you were in a vehicle you would totally miss the ‘experiences’ – so it’s not worth comparing what the cost differences would be! Your ‘experiences’ are priceless! Love you both!